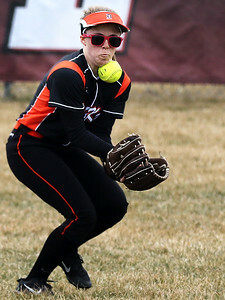 Left fielder Jadyn Ensign of DeKalb gets hit in the chin with the ball while attempting to scoop it up in the bottom of the fourth inning during their softball game at Huntley High School on Thursday, March 29, 2018 in Huntley. The Red Raiders of Huntley beat the Barbs of DeKalb 14 to 4. 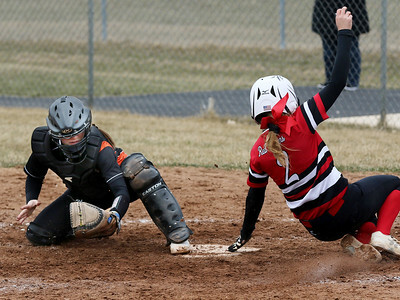 Ryle Levine of DeKalb (right) checks with the umpires to assure control of the ball after forcing Huntley's Grace Kutz out at second base during the bottom of the fourth inning of their softball game at Huntley High School on Thursday, March 29, 2018 in Huntley. The Red Raiders of Huntley beat the Barbs of DeKalb 14 to 4. 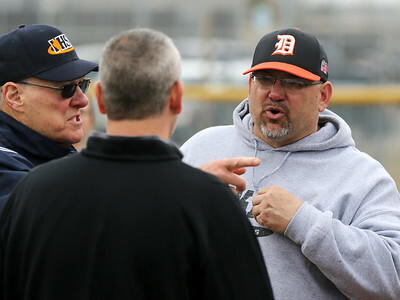 DeKalb coach Jeff Davis (right) and Huntley Coach Mark Petryniec talk with the umpires after the fourth inning of their softball game at Huntley High School on Thursday, March 29, 2018 in Huntley. The Red Raiders of Huntley beat the Barbs of DeKalb 14 to 4. 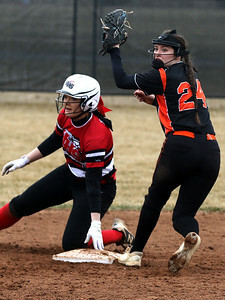 First baseman Jenna Levine of DeKalb makes the force out against Huntley in the bottom of the third inning during their softball game at Huntley High School on Thursday, March 29, 2018 in Huntley. The Red Raiders of Huntley beat the Barbs of DeKalb 14 to 4. 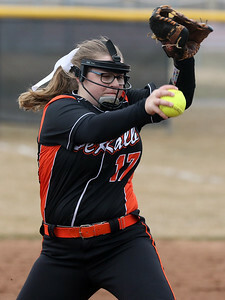 Pitcher Torrie Newport of DeKalb winds up for delivery during their softball game at Huntley High School on Thursday, March 29, 2018 in Huntley. The Red Raiders of Huntley beat the Barbs of DeKalb 14 to 4. 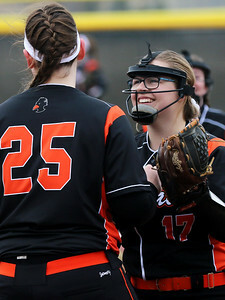 Pitcher Torrie Newport of DeKalb is all smiles as she celebrates a fifth inning diving catch made by third baseman teammate May Millard (left) during their softball game at Huntley High School on Thursday, March 29, 2018 in Huntley. The Red Raiders of Huntley beat the Barbs of DeKalb 14 to 4. 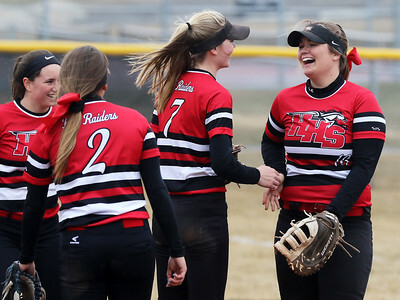 Huntley's (from left:) Paige Berkmeyer, Tiffany Giese, and Autumn Kasal celebrate with Taylor Pacana after Pacana stretched into a near-split to save a bad throw and record the force out at first against DeKalb during their softball game at Huntley High School on Thursday, March 29, 2018 in Huntley. The Red Raiders of Huntley beat the Barbs of DeKalb 14 to 4. 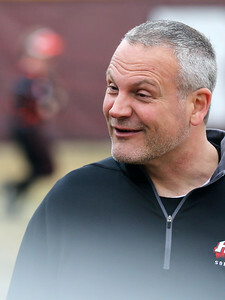 Huntley coach Mark Petryniec talks with the dugout between innings of their softball game at Huntley High School on Thursday, March 29, 2018 in Huntley. The Red Raiders of Huntley beat the Barbs of DeKalb 14 to 4. 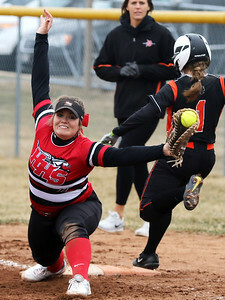 Huntley's Taylor Pacana stretches out into a near-split to save a bad throw and record the force out at first base against DeKalb's Jadyn Ensign takes on DeKalb during the top of the fourth inning of their softball game at Huntley High School on Thursday, March 29, 2018 in Huntley. The Red Raiders of Huntley beat the Barbs of DeKalb 14 to 4. 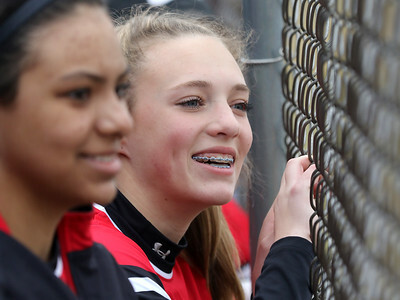 Huntley's Briana Bower (left) and Marley Reicher cheer the Red Raiders on against DeKalb during their softball game at Huntley High School on Thursday, March 29, 2018 in Huntley. The Red Raiders of Huntley beat the Barbs of DeKalb 14 to 4. 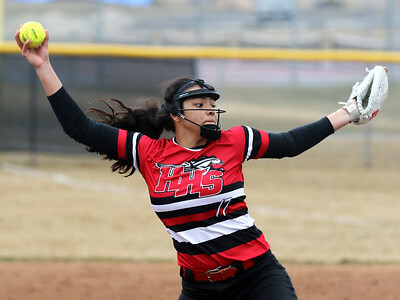 Huntley pitcher Tiffany Giese hurls the ball to DeKalb during their softball game at Huntley High School on Thursday, March 29, 2018 in Huntley. The Red Raiders of Huntley beat the Barbs of DeKalb 14 to 4. 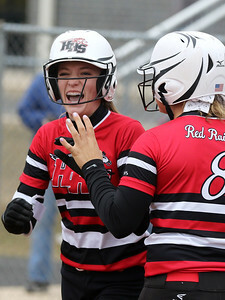 Huntley's Marley Reicher (left) is congratulated by teammate Sofia Tenuta upon scoring a run against DeKalb during a four-run bottom of the second inning in their softball game at Huntley High School on Thursday, March 29, 2018 in Huntley. The Red Raiders of Huntley beat the Barbs of DeKalb 14 to 4. 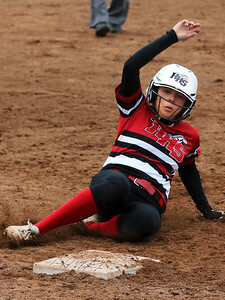 Huntley's Tiffany Giese slide safely into third base in the bottom of the fifth inning against DeKalb during their softball game at Huntley High School on Thursday, March 29, 2018 in Huntley. The Red Raiders of Huntley beat the Barbs of DeKalb 14 to 4. Huntley's Tiffany Giese slides around the tag attempt by DeKalb catcher Amanda DuBeau during the bottom of the fifth inning of their softball game at Huntley High School on Thursday, March 29, 2018 in Huntley. The Red Raiders of Huntley beat the Barbs of DeKalb 14 to 4. 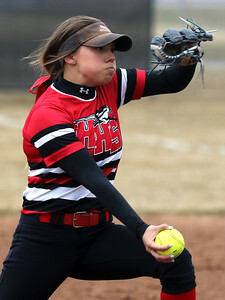 Briana Bower of Huntley winds up for a pitch to DeKalb during their softball game at Huntley High School on Thursday, March 29, 2018 in Huntley. The Red Raiders of Huntley beat the Barbs of DeKalb 14 to 4. 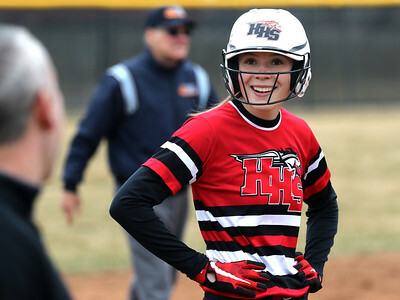 Huntley's Autumn Kasal chats with head coach Mark Petryniec after safely reaching third base against DeKalb during their softball game at Huntley High School on Thursday, March 29, 2018 in Huntley. The Red Raiders of Huntley beat the Barbs of DeKalb 14 to 4.